This past weekend we went camping near Lake Arrowhead in the San Bernardino Mountains. After setting up camp late Friday afternoon, we went to dinner at our favorite restaurant on the mountain, ate great food and had wonderful conversation. Saturday morning we had a french toast breakfast at camp, then we spent the day visiting with family and old friends, had a barbecue on the dock and went boating on the lake. Saturday night was spent visiting by the campfire talking and making smores. Then Sunday morning my amazing husband made breakfast for all. After we packed up camp, we went shopping in the Village and then headed home for a long nap. We had a great time and are looking forward to the next time!!! Although I did not take many pictures this weekend, Below I describe how I decorate our campsite and I've included some inspirational pictures of things you can easily do too. 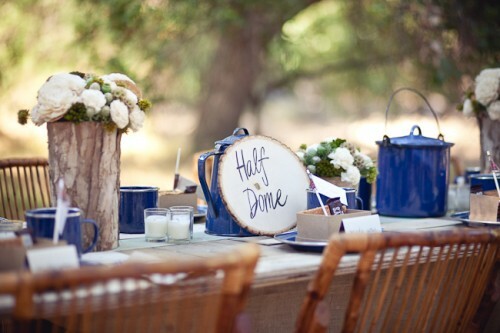 Many of the ideas work for both camping and picnics. 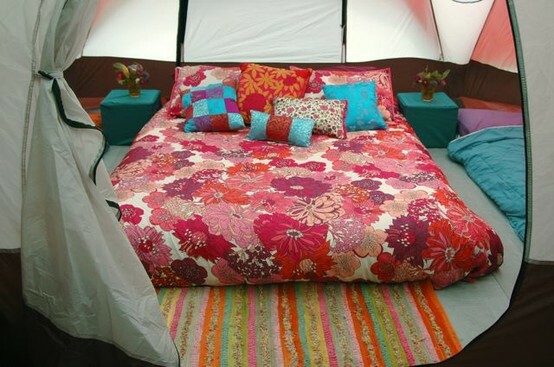 When we go camping I like to decorate the campsite. I don't overdo it, but I definitely have to put my touch on things. We camp the old fashioned way with a tent. We do bring air mattresses so we aren't completely roughing it. I like to bring bedding and a few throw pillows for the beds along with a blanket throw across the bottom to make it feel a little like home. In the tent I add a few of the battery operated tea lite candles for a little ambiance. Around the camp I like to use inexpensive solar lights to light our path at night. 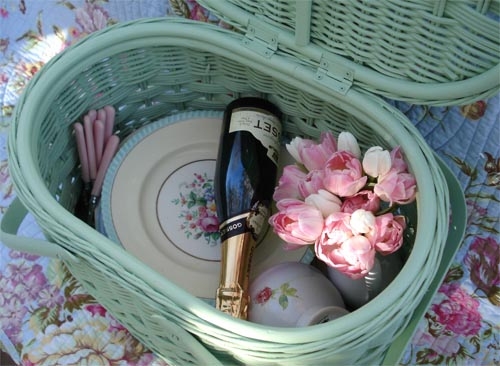 On the picnic table, I put a tablecloth and a centerpiece. 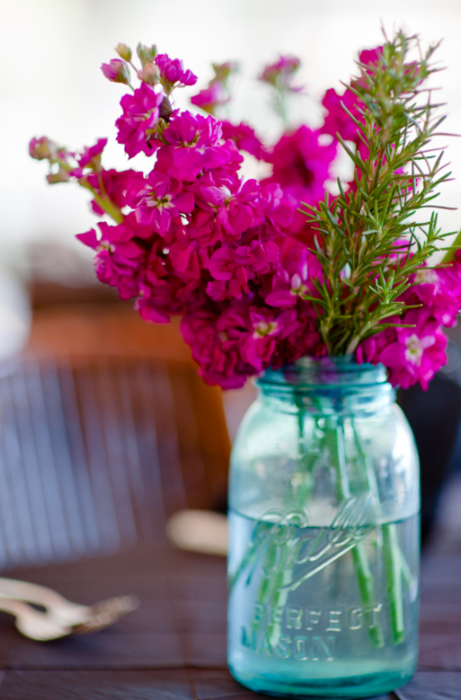 Mason jars work great for candles and to hold flowers. I don't go as far as to bring an area rug, but I have considered it. 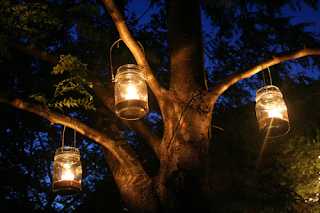 Mason jars with wire around the top can be hung from the trees with tea lite candles to add a warm glow to the space (if fire is too dangerous you can use the battery operated votives in the jars). 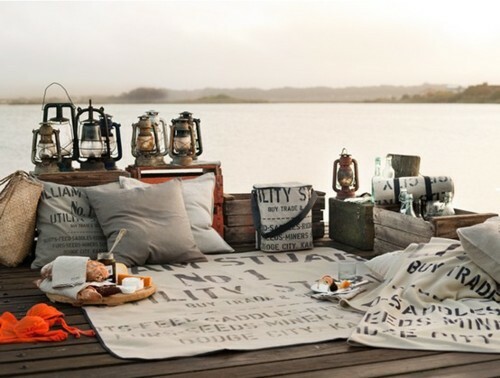 A few blanket throws on the folding camp chairs are wonderful to snuggle with next to the campfire. Most of all I just have fun with it and everyone seems to enjoy the effort. There is also what is called Glamping as is shown in the picture to the left. There are campsites that have permanent tents that are fully decorated. For those who would rather just show up and have some fun, try Glamping. It can feel almost like a 5 star resort, but you get to enjoy nature, a campfire and the stars. 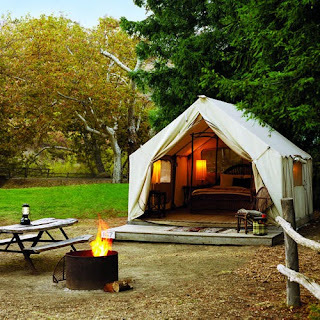 Look up Glamping via any search engine for a Glamp Campground near you. Whatever you do have FUN! Away on Vacation... New Posts to Come Monday.